Deltona Solar is your trusted solar contractor for the most diverse solar energy products in the market. We install solar panels, solar water heaters, solar pool heating, and more. We also perform projects on any size, and service both commercial and residential clients. Our goal is to install the highest quality solar products in the market, and always offer our services at a competitive price. Focusing on your home's energy efficiency is a long-term imperative, as more and more people are understanding. People so often get too comfortable and too excited about short term drops in energy prices. Sure, oil and gas prices are at their lowest prices in years, but they are more than likely to go back up again in the not too distant future. While you are enjoying the savings on oil and gas based energy now, it is also a great time for those in Deltona and the Volusia County area to invest in solar technologies that will help them earn even more savings and also prepare them for a greener and less expensive future, too. Volusia County has a lot to offer those that live here, and one of those things is abundant year-round sun. It makes it one of the ideal spots in America to take full advantage of solar services and products. These products have long been rumored to be expensive to install, but as technology and manufacturing have gotten more efficient, the cost of these products have subsequently gone down too. When you combine that with their durability, available tax credits, and big energy savings, they will more than pay for their cost in just a few short years. Any solar apparatus will only work as advertised if it is a quality made product. The most important part of any solar product is the solar panels (sometimes called solar collectors) themselves. That is why at Deltona Solar we use only the finest solar panel products with the latest technologies built right into them. How does Solar Technology Work? We will try and put this in clear, understandable terms. This technology consists of panels that have what are called photovoltaic cells built into them. These cells are what enable the solar panels to capture the energy from the sun’s powerful rays and then store it to be used later. Quality photovoltaic cells are made up primarily of materials that contain such things as crystalline silicon and gallium arsenide; for those of you that are familiar with computer microchip technology they are very similar in the way they work. When the sun’s rays are collected, these special panels convert, and then store the energy, as a usable energy source. We only sell the highest quality solar panel products because the effectiveness and capacity of each individual solar panel is determined by both its size and the quality of materials used in the manufacturing of it. We will never install anything in your home that is less than superior quality. These solar panels are most often installed on your roof. This gives them direct exposure to collecting the most sunlight possible during the day and helps to conveniently keep them from taking up space if located elsewhere around your home. There is nothing that says they have to go on your roof and many people build stands for them in their yard and put them on those too. The bottom line is it does not matter where you put them as long as they get a majority of the daily sun hitting them and they are a quality constructed solar panel like all those that we sell and install. Want to make your solar panel system even cheaper over the long run? Then try adding a device that can supply your home with hot water off the system, as well. It is estimated that over 30% of a home energy bill comes from heating the water you use to bathe, shower, wash dishes and all the other things you use hot water for. Can you imagine how much you will save if this hot water is being produced by the sun’s rays instead of oil, gas or other non-renewable energy sources? It will be quite a substantial savings to say the least. Solar water heaters don’t need to change the sun’s rays into usable energy, so they are some of the least expensive types of solar products that you can buy. They simply supplement your existing water heating system and they work by passing water slowly through the solar collectors which then warms it up substantially. Solar pool heaters from Deltona Solar work much the same way that solar water heaters work. They take the heat that collects in the solar panels and use it to heat the water from your pool as your pool pump passes the water through the warm tubes inside the panels. The nice thing about generating solar pool heat is that it does not matter how cold it is outside as long as the panels are getting direct sunlight. This makes your swimming pool comfortably usable almost all year round at an affordable price. You can even run this solar device at night to slightly cool the swimming pool water during the hotter months too. Without solar pool heaters, you can only expect to swim comfortably for 6 months per year – April thru September. After proper and effective solar pool heater installation, you can increase this window of time to 9 months. So it makes sense to make this investment, given the price you likely paid for your Florida swimming pool. Deltona Solar also installs solar AC units that run on energy that is collected in the panels after they convert the sun’s rays into a usable energy form. This energy in turn supplies the power to run the compressor that then supplies the cold air that is then fed into your house. Essentially, they are just regular air conditioners that run off of free energy from sunlight as opposed to expensive electricity that you pay for from your local utility provider. There is no guarantee that the power will always be on in Deltona, especially after a hurricane or other types of severe weather pass through the area. That is why solar generators are a cheap means of providing you with power to run the basics in your home at these and other times when the regular power is not working. Want to save even more money? Then we have do-it-yourself solar panel kits that are simple to put together and will allow you to install simple solar devices for your home yourself. It is hard to understand why most everyone does not have a solar attic fan installed on their home. Quite frankly, this should be a requirement in new home construction because of the energy savings and other benefits they present to homeowners and building owners. Not only do these fans run on free natural sunlight, but they save you hundreds of dollars each year on your energy bill by making your home easier to cool in the warmer months. Another great benefit is that they remove the warm air from your attic, which not only creates a much more efficient building envelope, but also makes your attic cooler, dryer, and much better area for home storage. At Deltona Solar, our technicians will work with you every step of the way to help you with your solar energy product needs. With our help you will be able to determine not only which solar energy products best meet your needs, but which ones meet your budget concerns too. We know the products we sell very well and we know how they will best help you save money, and add convenience and savings for you and your family. Our professional solar auditors will also prioritize your solar investments based on the projects that will provide you with the quickest return on your investment. There are more ways we can help you than just with advice from our experience, too; we can actually help you with a free energy analysis. This will pinpoint the areas in your energy spending that are costing you way more money than they should. It will go a long way toward putting into perspective how you can spend a little money now on solar products that will provide you with big savings well into the future. Once your energy analysis is done, one of our skilled technicians will review your solar options with you and guide you on which of our solar products will give you your best return on investment. You will probably be amazed at some of the cost saving figures that they will provide you with. Solar energy really is that good at saving you money over time. Many people also do not realize that having solar energy devices installed on your home will actually increase your home’s value. So you not only will you save big on your monthly utility bill, but you will also increase your home’s value if you should ever decide to move. This is just another good reason to invest in green and renewable solar energy. We can handle any and all of your Deltona solar energy needs and there is no such thing as a job that is too big or too small. We can also take on any solar project, whether it is at your place of residence or at a commercial property you own. There is no limit to the places that at least some form of solar energy can be used to realize savings and build value for you. Keep in mind that we only install the highest quality solar products in the market. That goes in line with what we said earlier about getting the best energy savings results from the products that are made with the most up-to-date technology and highest quality parts. After all, if you are going to invest in solar energy then you might as well get the most savings potential out of every dollar that you spend, as well as be assured on the long-term durability. Once you have chosen which solar energy device is right for you, then it is time for our highly skilled installation teams to take over from there. They will work with you to determine where and how to place your solar energy purchase so you can get the most energy savings benefit from it. Once that is done, they will then proceed to expertly install the product in the place you have chosen, and do it in a way that does not affect the other activities around your house, and they will always keep safety in mind while working. The quality installation crews at Deltona Solar often get rave reviews from the customers they serve not only for the way the product looks and performs after it’s installed, but also because of their professional attitude and courtesy displayed throughout the entire installation process. Our veteran installation crews will even show you how to operate the device and also give you any maintenance pointers that are necessary before they leave the jobsite. One of the most powerful features that we offer is the ability to monitor the performance, in real time, online. The website shows in amazing detail the amount of energy that is being expended, as well as what you're saving. It is very powerful technology that will make your solar investment an easy decision. Our service does not stop after the sale or even the installation of your new solar system. Our trained technicians are standing by to take care of any routine maintenance, warranty or repair needs that you may run into during the life of your solar energy product. We carry many parts in stock and we will be able to guide you as to the periodic service needs of your solar device that it calls for. We believe in a partnership that lasts; not one that ends when the technicians tail lights can no longer be seen after they leave your driveway. Our commitment to our customers is what keeps our sales growing each year and we realize the benefits of the positive word of mouth that we get from each and every one of them. We truly go the extra mile to give you a positive overall experience with Deltona Solar; no matter whether it is during the sales phase, the installation or any subsequent need you have thereafter. 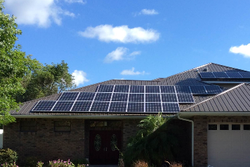 Our company has the most experienced solar technicians you will find in Deltona and the Volusia County area. We can even service other solar energy brands besides the ones that we sell, because our technicians understand the concepts of solar technology so well. Right now is a great time to buy solar energy products. Local government branches are usually offering solar energy installation rebates in the form of tax credits and we have several different financing options available for you too. We work with banking partners that can offer you great rates to finance your solar installations. There is no better time to buy than right now. At Deltona Solar, our trained solar energy staff is standing by to help you today. We would be more than happy to schedule your free estimate, as well as a free energy audit at your home or place of business, and guide you as to how solar energy products can meet your need and guarantee you long-term savings, too. So give us a call today at 386-320-7205 and see what are many solar services and products can do for you, your home, and your family.